Apothecary tables are charming pieces of accent furniture, whether it's an antique or vintage treasure or a modern reproduction that captures the look and feel of a bygone era. Despite their antique origins, these tables are anything but obsolete in terms of being functional and useful in the home today. Apothecary is an old-fashioned word that refers to a pharmacist or a medicinal healer. Apothecary tables and console cabinets have a very distinctive look; typically characterized by rows of small, square compartments or drawers designed to organize and categorize collections of herbs, spices, elixirs and ointments. The strong geometric lines and symmetry of the furniture gives it a very formal, sophisticated aesthetic. However, the finish can have a strong influence on its overall style. 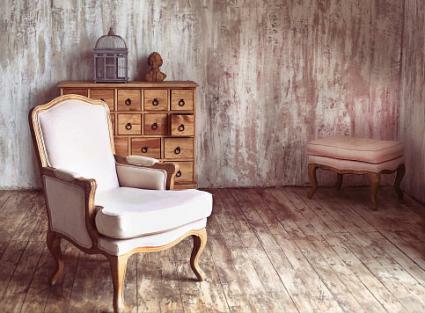 Distressed or chalky finishes complement rustic, shabby chic and cottage styles while lacquered, glossy or satin finishes befit traditional, formal and contemporary settings. Tables with iron or brushed metal hardware and those featuring iron or metal casters incite a vintage or antique industrial feel. Apothecary tables can be used practically anywhere in the home, depending on the tables shape and size in relation to the space it's going to occupy. Take measurements in the areas you might be considering to ensure the table you buy will fit. The style of the table should also make sense with the style of the room or perhaps the table will inspire a whole new look for the room. 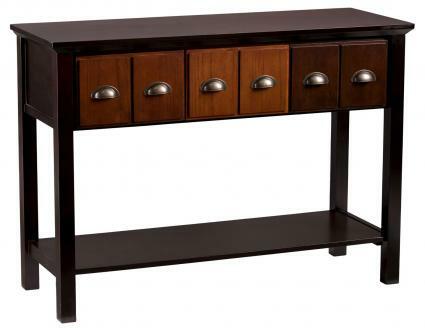 Showcase an upscale table, such as an Asian-style cabinet with a shiny lacquered finish, in the entryway of your home. Play up the table's posh, formal vibe with a few like-minded accessories such as a large mirror with a lacquered frame, a Longevity style accent chair and a colorful bouquet of silk flowers in an Oriental style porcelain vase. Use the table's multiple drawers to store business cards and flyers left at your door, keys, mail, eye glasses, sunglasses and spare pocket change; ordinary clutter put out of sight and out of mind. A guest powder room is a good option for an antique table. It's a small space that you can decorate to mimic a turn-of-the-century apothecary or old-time drugstore. Display pretty, floral shaped hand soaps in apothecary glass jars on the tabletop, along with a jar or two of old-fashioned candy sticks. The pedestal and mortar is the national emblem for an apothecary and would make an excellent final touch on the table. Hang old wooden shelves displaying antique medicine bottles and framed antique-style flyers or posters advertising early patent medicines, elixirs or traveling medicine shows. McMurray Auctions is a good resource for antique apothecary related items. Stock the drawers with common over-the-counter medicine for headaches, heartburn, eye drops and travel size bottles of hand sanitizer, hand lotion, mouthwash, etc. Create cute labels for the contents inside so guests can refresh themselves quickly and easily. Buffet style apothecary tables make wonderful accent tables in the dining room. Brighten the top with a cheerful display of seasonal flowers held in an old vintage pitcher. Include a grouping of tall wooden candle holders that can also be used on the dining table during special dinners. In the pull out drawers, store extra cutlery and serving utensils. Use the buffet table as a carving station when serving large cuts of meat, or as a self-serve drink station or dessert station during large family meals. Use a narrow table that won't block or impede traffic flow in a hallway or a small cabinet for the end wall. Display a few family photos and small collectibles or figurines on top. Hang a framed picture that is approximately 2/3 the length of the table on the wall behind it. Store paper and pens inside the drawers to leave notes on the tabletop for family members. The drawers can also be handy storage for things like cell phone chargers, extra batteries and flashlights, candles and lighters in case of a power outage. Apothecary tables with dark wood finishes and iron metal hardware have a masculine look that would translate well in a den or man cave. Use the table to display trophies and framed photos of the team or your star athlete in action. Or maybe a hooka collection is more his style, with plenty of spots to store flavored tobacco. The table could also serve as a mini bar, proudly displaying top shelf liquors on the top shelf with the drawers stocked with smaller accessories such as straws, swizzle sticks, shot glasses and drink coasters. Look for a table with a finish that will complement the color of your cabinetry or a table with a similar design style, such as an industrial style table for an industrial style kitchen. Choose a table with lots of storage compartments to store all of your spices or use it to store miscellaneous things such as skewers, kitchen matches, candles, measuring cup sets, etc. Use the top to display a collection of cookbooks, a decorative set of hand painted wine glasses or a few pieces of vintage cookware. 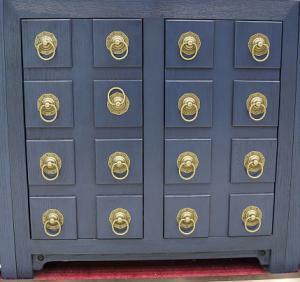 Some apothecary tables have the look of multiple, small compartments on the outside while inside the storage is set up to hold electrical components. A table like this is perfectly suited as a base for a flatscreen television, as it also features a ventilated back to accommodate electrical components and built-in grommet holes for electrical cords. Use wooden or wicker baskets to keep storage items neatly organized within the cabinet or use a shelf stand to hold DVD movies. Tall, narrow tables can also be placed behind the sofa in the living room, where you can style the table with houseplants, framed sepia photos for a vintage feel and an interesting artifact such as a vintage mantle clock or an antique model car. The following examples show different designs and styles of apothecary tables in a wide range of prices. Keep in mind that some of these examples don't have the term "apothecary" in the name or title of the table, so it helps to become familiar with the look. 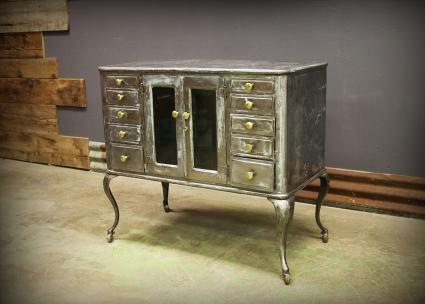 This Antique Apothecary Dental Cabinet features a brushed steel finish, 10 pull-out drawers and a central cabinet compartment. Delicate, cabriole style legs give it the look of French period furniture; an excellent accent piece for any formal, traditional or upscale setting, or as an eclectic accent in a modern setting. You can find it at Industrial Artifacts for about $2600. Note: Since this table is made entirely out of metal and glass, it wouldn't be affected by the humidity if used in a regular bathroom or near a window exposed to direct sunlight. 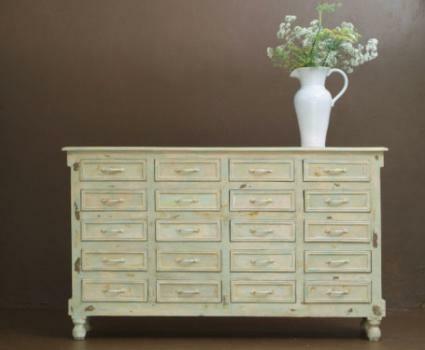 This charming turquoise buffet table by Pulaski furniture features a naturally aged finish with realistic rub-through distressing and classically turned legs. 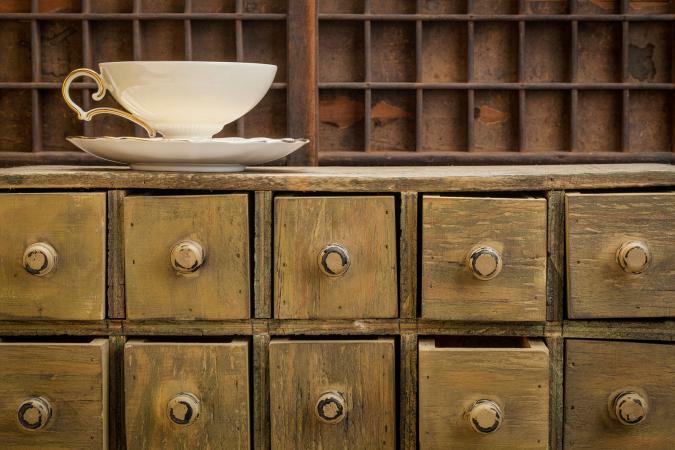 Antique brass hardware provides the characteristic apothecary look of multiple compartments on the two front drawers. The style and finish of this table would make it a perfect accent piece in a country, farmhouse, cottage or shabby chic styled room. The table is available from a variety of online sellers, under the name, 'Emily Leg Console" or "Naomi Destressed Turquoise Leg Console," going for as high as $580. However, you can get it for about $280 with free shipping at Amazon if you're a Prime member. Note: This table does require assembly but two out of four customers say it is easy to assemble. With just two drawers, it also has less storage space than other types. The 18 Drawer Accent Cabinet by Y Decor has a height adjustable top made from mango wood and features nine functional drawers on each side of the table. A lower level shelf provides additional space for storage or display items. 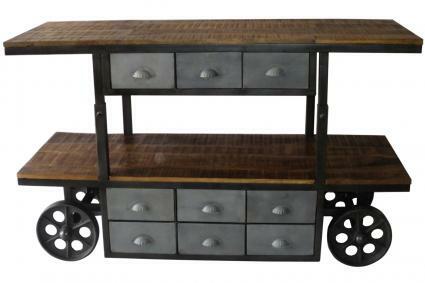 The vintage railroad cart style casters provide stylish portability, making it a great addition in an industrial chic or urban loft type setting. Get it at Wayfair for about $630. Note: If the wheels of this table don't lock, you may need to buy a caster brake kit to keep the table stabilized when you don't want it to move. The Twilight Bay Antique Linen Andrews Media Console has the classic look of an apothecary table with dozens of small square compartments. However, most of them are an illusion. This stand is designed to accommodate modern media components, with two drop-down drawer fronts, side column storage and four inner shelves behind center paneled doors. Nostalgic style paired with modern design makes this stand a good option for most contemporary and minimalist style homes. It's available at Coleman Furniture for about $2374 on sale or $3500 regular price. It qualifies for a free protection plan worth $200. Note: As high as this stand is priced, it should be made from solid wood but the product description fails to specify the material. The compartments are real on the Zeppo Vintage Style Storage Chest by Furniture Creations. It features nine storage drawers that vary in shape, size and color. This adorable little cabinet has a patchwork quilt-type-feel that would look right at home in a rustic, country or bohemian style setting. You can find it on Amazon for just a little over $500 with free shipping. Note: This sturdy little cabinet is worth a higher price because it is made from solid wood and wood veneers instead of particle board. The Wells Console Apothecary Table by Aiden Lane features the straight, clean lines of Mission style furniture and what appears to be a row of six compartment drawers in various light and dark natural wood finishes. The table actually contains three working drawers and a bottom shelf. It's deep espresso finish and antique bronze drawer pulls make it an attractive accent table for any modern or contemporary home. You can find it at Target for about $240. Note: If considering this table for a sofa table, the table should be about 12 inches shorter in length than the sofa and the table's height should be about the same as the sofa's back. This table might work behind a small sofa or loveseat. As you can see from just six tables, there are endless styling options and functional uses for apothecary tables in homes today. The right table is out there, just waiting for you to find it.